Today's post is about my latest haul. I also found one of four H&M Holo-polishes and the ones that carries them only sells them one at the time and not all at one time( I first saw the pink one, now the golden one, I hope, I can get the others). I also bought two Hello Kitty polishes because of their really cute bottles and the black one is really opaque which I never would have expected( I just swatched it on a piece of paper). 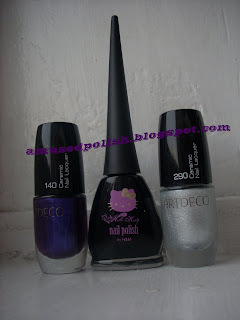 I just bought the silver polish of this collection(no. 290). 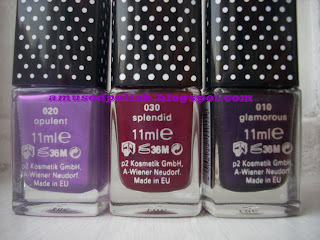 And last but not least there are three P2 polishes. P2 is an German/Austrian Brand and is sold in Germany(there in a drug store called "DM") and in one tiny store in Vienna(which is ridiculous because the polishes are produced in Wiener Neudorf, Austria). The polishes are from a Limited Edition called "What a Girl Wants". I couldn't capture the Holo-effect because the sun was hiding and the weather is quite terrible at the moment( and still is). 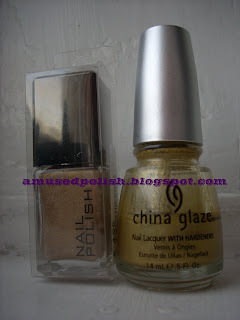 As you can see in the pictures, Gr8 is a more yellow-sand based tone, where CDLC is more a light-brown Holo. Sag bei welchem H&M hast du den Holo Lack gekauft? Ich find die bei unseren H&Ms nicht. Und ich wusste gar nicht, dass es schon die P2 LE gibt. *freu* Letzte Woche gab's die noch nicht. Die zwei rechten Farben entsprechen genau meinem Geschmack. Those are adorable polish bottles. I'd like to see them swatched soon.